The Maytag MVWB800 is even bigger when it comes to capacity than the 4 cu. ft. machines out there. Let's see if this washer is not only big in size but also in performance. Here's a point-by-point evaluation of its features and overall performance. Though this machine may look and measure just a little bit larger than other large top loaders, the Maytag MVWB800 has a super size capacity of 4.7 cu. ft. This washer can take on heavy loads of laundry whether it's a whole week's worth of clothes or a batch of drapes and curtains. Some people consider large washers to be just a waste of money, but they'll be happy to find out that the Maytag MVWB800 is water- and energy-efficient. The Maytag Commercial Technology makes this washer a highly efficient machine to handle different loads and types of laundry. The 4.7 cu.ft. drum can take in large loads, but are smartly designed to reduce water, energy, and even detergent use. This top loader has a wide opening lid with SmoothClose hinge to ensure fast and careful loading of the laundry. It's farily easy to monitor the progress through the commercial-grade glass window of the MVWB800. The Maytag MVWB800 is made of durable parts that can withstand time and wear. Its commercial-duty stainless steel wash basket securely keeps the laundry in the drum, while the commercial capacity direct drive motor keeps things running at full speed, all the time. The laundry is still gently taken care of when washed using the Maytag MVWB800. It is powered by the Sensi-Care wash system and IntelliClean impeller, so unlike the usual agitator, it gently cleans without causing damage to the strands of the fabric. Simply put, fabrics are gently but thoroughly cleansed, while quality and color are preserved. But even before detergents and other laundry products work on the clothes, the Maytag MVWB800 does something to ensure the cleanliness and sanitation of the fabrics. This washer has an NSF Certified sanitary cycle that cleans the insides of the drum first with water and a special substance that bursts out of the timed oxi dispenser. This special oxidized cleanser thoroughly gets rid of any leftover dirt, smell, and bacteria in the washing machine, so these won't get into the laundry. The Maytag MVWB800 also has an internal water heater with Clean Boost option that not only regulates the temperature of the water for easier stain removal but also for sanitation purposes. Despite being fully automatic, the Maytag MVWB800 allows users to manage the laundry cleaning the way they want to. There are 14 wash cycles and five temperature settings to choose from, whether its for laundering delicate baby clothes or dusty drapes. This washer also features the MaxExtract extended spin option, which takes out almost all of the moisture from the laundry after washing, making it faster and easier to dry. Not only will this help save time, but will also regulate energy use when using a dryer. The Maytag MVWB800 is nothing like those monstrously big washers that chug noisily and spit bubbles. Despite having a good variety of features and a powerful motor, this washer is a quiet operator. With the QuietSeries 400 sound package, it would be easier to concentrate on other things without being interrupted by any noise from the working machine. No more soapy spills on the floor because this washer is equipped with Smooth Balance suspension system with Superior Vibration Control that keeps it steady. 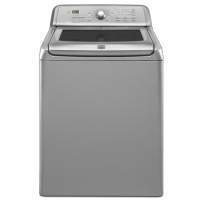 Many homeowners who want heavy duty performance from a washer found themselves shopping for the Maytag MVWB800. This large capacity machine is ideal for the laundry needs of a large family. Though its size may make it seem like it consumes a lot of water and energy, the Maytag MVWB800 is actually efficient and ENERGY STAR qualified. Some consumers even qualified for rebates and have noticed the significant savings they made from energy, water, and detergent use. Despite being almost like the perfect large capacity top loader, there are some people who find the Maytag MVWB800 not too ideal for them. Its price is one of the foremost reasons for this. It is priced at more than $1,000 and can be out of range for some families. For this price, some would opt for sleek front loaders. Since it's also a large unit, installation is hard as it requires space and a lot of headroom for the top-loading function. When looking for a heavy duty washing machine that can meet the standards for a clean and thorough wash, then the MVWB800 definitely deserves a second look. Quality may come with a price, but consumers can think of this as an investment for diminished energy and water use and longer performance. This very expensive four month old dryer is labeled a "quiet series 400," but sounds like a concrete mixer full of baseballs. My cheap Kenmore was 100% quieter than this model. A technician came out, tightened everything and suggested I get a rubber mat to place under the dryer, which I did to no avail. Clothing does not get dry using the sensor setting. More time is always needed. I would NOT buy this dryer again. I paid a premium for an energy-efficient top loader about four months ago and am very disappointed. Clothes do not get clean and knits or socks become "pilled" from the action of the washer. The obnoxious tone that plays each time the machine is turned on or off serves no purpose. I would not buy this washer again.